This article, which originally appeared on May 20, 2016 in the Nashville Business Journal, was written by Eleanor Kennedy. 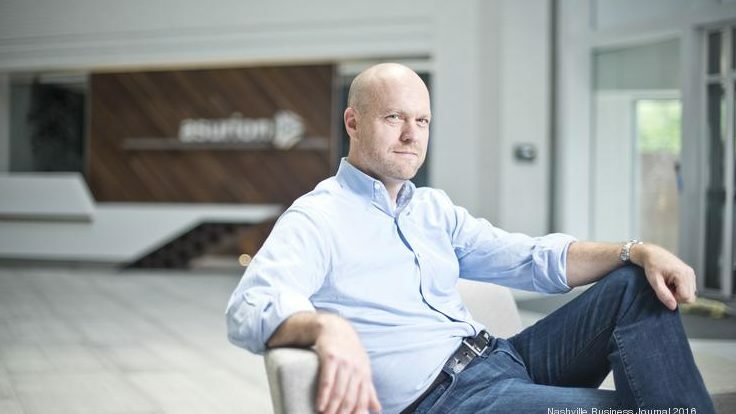 Barry Vandevier, Chief Technology Officer of Asurion, has lived the tech startup life, helping to launch Travelocity back when booking a flight online was an unusual thing. But he’s also lived the corporate life, from his early days at American Airlines to the more mature years of Travelocity. Today he leads the technology operations as chief information officer for Nashville-based Asurion, which provides insurance and tech support for mobile devices. Appropriate for a man who spent part of his career helping people book flights, you’ll often find Vandevier piloting a single-engine plane or cheering on one of his daughters at a swim meet or horse show. Where are you from originally? I was born in Missouri, and then quickly moved over to Germany ­— my father was in the military — and then grew up primarily in Oklahoma. And how long have you been in Nashville? Three-and-a-half years. What does your typical workday look like? If I’m not traveling (we’re very global, so I spend a lot of time traveling) … my normal office is downtown. I spend a lot of time on meetings with teams, individual one-on-ones … whether it’s project meetings, status meetings, meetings with clients. So my typical day involves coming to work after I drop my daughter off at school, getting caught up a little bit, then it’s right in to quite a few meetings. We’re so global, we do a lot of video conferencing. I just got off one with Israel. When you do travel, what are your favorite and least favorite places to go? I don’t know that I have a least favorite, I love to just see the world. I spend a lot of time, in the U.S., in San Francisco or Sterling, Va., which is outside D.C., which are both great cities. Internationally, I usually either go to Japan, the Philippines — where we have a large, sizable team — or we’ve got a team in Hong Kong. But mostly it’s Japan or the Philippines, and then we’ve got a team in Europe. So it’s hard to beat any of those locations, really. Is there anywhere for work or personal travel that’s on a bucket list for you? Definitely. I’ve not been to Italy. My wife and I have been married a long time, and I promised her I’d take her to Italy before I go on business. That’s on the list. South Africa I’d love to go visit. Those are probably the big ones on the bucket list, the two big ones. But I’ve been a lot of places. Do you have a travel pet peeve? Probably just delays are the biggest issues. Particularly when it’s delays, and then they broadcast like 10-minute delays, which you know is not going to happen. It’s like, “OK, just give us the reality of how delayed we’re going to be rather than just teasing it out 10 minutes at a time. What was the first paying job you ever had? I started my own lawn-mowing business. I think I was about 14. I paid for a motorcycle at 15, and I paid for my first car myself with my lawn-mowing money. Me and my buddy went into business; we probably had 40-plus yards that we mowed. I did that for a little while and then one winter I thought I’d try the restaurant business, and that lasted for just the winter. Mowing’s better. I was washing dishes. Lawn mowing, I had my own hours, I was in charge, the money was better. Do you still ride motorcycles today? I had a motorcycle years ago, I do not now. Actually I fly airplanes, I’m a pilot. How long have you been doing that? About eight years. All single engines. How’d you first get into that? I had a friend with a 1948 Stinson Taildragger that I would go up all the time with. And I would fly the plane with him in there, but I never could land or take off. And I decided I really wanted to learn. … So I decided to go get lessons. And we actually went in together on an old plane, refurbished it … and I sold my half of it back to him. So I rent. What was the first car you bought? It was a wrecked Ford Mustang, so my dad and I fixed it. We just had to replace a door, and then repaint it. What is your typical weekend, is that when you do a lot of flying? I do, I try to get out very early Saturday morning, like 7 a.m., before the family gets going. I try to fly every weekend if I can. A couple of weekends ago I took my daughter to Chapel Hill for a college visit, and I flew her. … I’ve got two daughters, one a junior in high school and one’s a sixth grader. They’re both very active; one swims and one rides horses. So between the two of them, if I’m not going to a swim meet I’m going to a horse show. Do you have any sports loyalties? My bachelor’s degree was at Oklahoma State, my master’s degree was at Southern Methodist… I spent so many years in Oklahoma or Texas, so the Dallas Cowboys, and Oklahoma Stat’s the Cowboys, so I just say the Cowboys. Honestly it’s mostly around Dallas, on the professional side…And then on the college front it’s usually the Oklahoma State Cowboys because they’re way better than SMU. Are you binge-watching any TV shows right now? No, I don’t watch a ton. We record some, like “The Voice,” that we all we watch on occasion. This is something only I like, but I do like “The Walking Dead” and then “Game of Thrones,” so I record those and watch them when the family’s maybe out, or not around, because I’m the only one in the family who likes to watch those.